After peaking in 2008, the collapse of natural gas prices theoretically saved Americans nearly $250 billion over 3 years. Had the net savings been a stimulus package, the first year alone would have been the 2nd biggest in history. Seven years of low natural gas prices have resulted in plummeting wholesale power prices (what the utility pays), but few Americans feel like they’ve seen any benefit, especially on their electric bills. Although natural gas prices, which are the biggest input into the electric system, have declined by 39% over the last decade, electricity prices have risen by 40%. As the industry saved around $30 billion a year, consumer rates still rose faster than inflation. 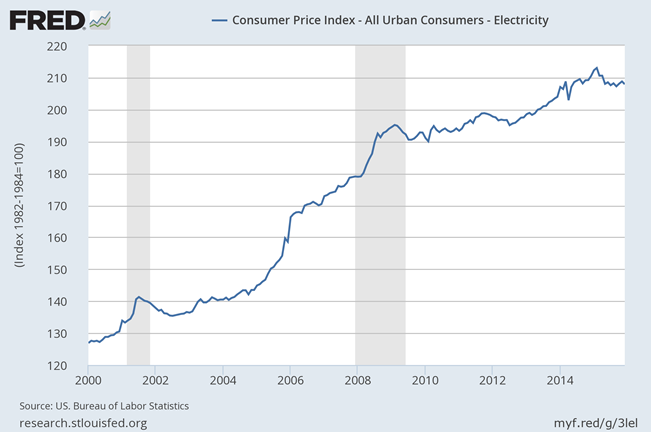 This is perhaps the most clear example of the fundamental problem with how electric utilities are paid. Regulated electric utilities make money by building infrastructure and recovering the cost, with interest, through monthly electric bills. The more they build, the more they make. Most are public companies, making them responsible to their shareholders to build as much transmission and distribution infrastructure as they can get away with. To avoid unnecessary investments, public utilities commissions (PUCs) are supposed to represent the public interest in approving utility investments. But electric utilities have successfully funneled the benefits of cheap gas into new projects. They are absorbing the benefit of low commodity prices by using the avoided expense to get projects approved by Public Utility Commissions without raising rates. Electric utilities have been on a spending spree. The Edison Electric Institute reported an a 151% rise in capital expenditures over the past decade, while electricity prices increased by 39%. Few are arguing that electric utilities don’t need to upgrade their infrastructure, it’s that there may be better ways to achieve desired outcomes. After Superstorm Sandy, PSEG announced a plan to mitigate the impacts of future storms by spending $3.9 billion, primarily for hardening substations. From the companies own data, the money spent would result in “a modest improvement in our ability to weather these storms,” according to Stefanie Brand, director of the New Jersey Division of Rate Counsel. Electric utilities were given monopolies because a natural monopoly does exists in transmission and distribution. The consumer would not benefit from multiple companies providing power grids. But if you empower people to provide their own electricity, it’s beyond the scope of both the utility and state regulator. Competition is entering the market like never before leveraging rooftop solar, demand response, and energy storage. Aside from the lack of competition, the centralized energy system itself is full of inefficiencies, with room for disruptive competition. Most potential energy fed to the electric system is lost either as waste heat at the generation facility or line loss from transmission. As complicated as it sounds to coordinate a power network of distributed energy resources, it’s already been demonstrated in the real world by CleanSpark and LichtBlick. Smart microgrids can balance themselves, while improving national security and resilience. Former CEO and current thought leader David Crane sees energy following a similar path of computers. In the 70s and 80s there were just a few massive, centralized supercomputers. Computers were a bulky, centralized systems. Then people found a way to string distributed PCs together, and the supercomputers weren’t necessary anymore. The computing power of distributed computers in the cloud surpassed all expectations. Though Crane admits getting in trouble at NRG for being ahead of the curve, the sharing economy for energy could be closer than we think.